Absolutely gorgeous! Beautiful wood floors though out downstairs! Berber carpet in bedrooms! 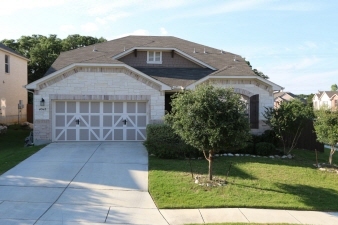 4 sides brick and stone on a corner lot with a huge covered patio plus an open flagstone patio! Chef's will love the gourmet kitchen with tons of Cherry cabinets, stainless appliances including a convection oven, granite counters & tile backsplash! Study with walls of custom bookcases! Fabulous split bedroom floor plan with downstairs master retreat! Upstairs is a huge living room, full bedroom plus a full bath...perfect for 2 families or that overnight visitor!